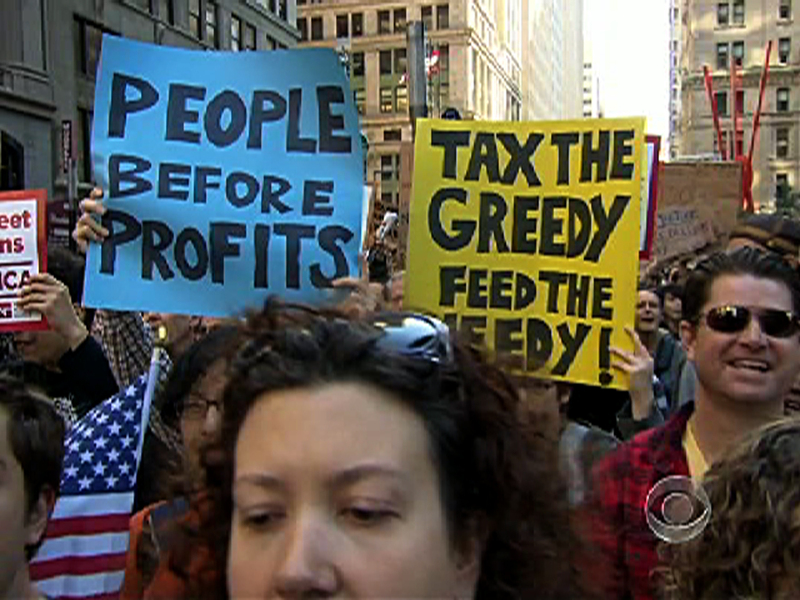 Can "Occupy Wall Street" become a movement? NEW YORK - Shortly before the massive "Occupy Wall Street" protest kicked off in lower Manhattan Wednesday afternoon, CBS News caught up with Transport Workers Union President John Samuelsen, whose union was among those that had decided to join the cause. Samuelsen, who can be seen in the video at left, was adamant that there wasn't a culture clash between union members and the mostly younger, more culturally liberal demonstrators who initiated the protests. "The media might want to portray it as a different culture but it's not a different culture, we're all working people, and we're all not the wealthiest people in this country that are really getting a break right now," he said, adding: "There's a pervasive sense of abandonment of working families and working people in this country, these protests are all about that, that's why organized labor has joined in, because that voice is our voice." Yet once the speeches kicked off, one could have been forgiven for thinking that two different protests happened to be going on at the same time. In the front, union members in matching t-shirts listened to a string of speakers urging corporations to "get their hands out of our pocket." In the back, a drum circle had sprung up; pierced protesters danced and bobbed to the music, ignoring the words coming over the loudspeaker. "Occupy" and anti-war protests converge in D.C.
To be clear, a wide variety of people gathered in Downtown Manhattan's Foley Square on Wednesday. There was diversity both within the ranks of the union members and within the ranks of the protesters who had been with the movement from the start - not to mention the thousands of unaffiliated people who showed up simply to vent their frustration with an economic system they see as unfair. But there was no denying that the protest marked the uneasy coming together of two different cultures for a common cause - the top-down unions, which tend to operate within the political system, and the bottom-up, leaderless so-called "other 99 percenters" who tend to fully reject it. For the unions, the success of Occupy Wall Street has been somewhat bittersweet: A bunch of (mostly) kids without a shred of political influence had managed to focus the nation's attention on the very concerns that the unions have long sought to bring to the forefront, with little success. (And they did it in a little more than two weeks, no less.) But the unions that joined up were willing to put that aside if it meant potentially helping jumpstart a real left-wing movement. Indeed, Samuelsen appeared willing to essentially throw out the union playbook. He described Occupy Wall Street as "a spark that has ignited organized labor to finally bring this fight to the streets -- get it out of the corridors in Albany and the corridors in Washington, D.C., and on to the streets." Obama: "Occupy Wall Street" reflects "broad-based frustration"
"When working families start clogging Broadway, and start clogging the other financial districts in the cities around this country, then the decision makers in this country will finally start to listen," he added. But that's easier said than done. The Occupy Wall Street protesters proudly proclaim their lack of clear objectives, and protesters have advocated everything from campaign finance reform to an end to fracking to Palestinian statehood; for a labor movement that has long pragmatically pursued concrete goals, integration with that ethos is a significant challenge. If they try to impose top-down messaging on the emerging movement, union leaders realize, they risk destroying or delegitimizing it; if they don't, they fear, their best chance at progress could be lost amid a tidal wave of competing agendas. In Zuccotti Park, the heart of Occupy Wall Street, many of the protesters acknowledge that their movement is going to have to adopt some sort of structure in order to endure beyond the start of winter, when the cold weather will keep all but the heartiest from continuing their "occupation" of the park. But, understandably, none of them seems to want to be the first to try to impose one, for fear of seeming exclusionary or worse. Instead, they say, they're willing to simply see how it all plays out. For longtime union activists with concrete goals they want desperately to achieve (a tax increase for high-earners, new contracts for transit workers and other union members), that's an enormously frustrating approach, particularly considering how much traction the movement has gained in such a short time. But for now, at least, they're willing to go along for the ride.